If you are needing a quick and easy breakfast you will love this Raspberry Vanilla Overnight Oatmeal Recipe. 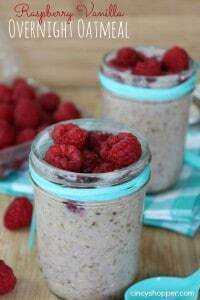 Overnight Oatmeal in a mason jar requires no cooking and are great for on the go breakfast. My daughter loves throwing these together quickly a few evenings per week. She then has a quick and easy on the go breakfast. 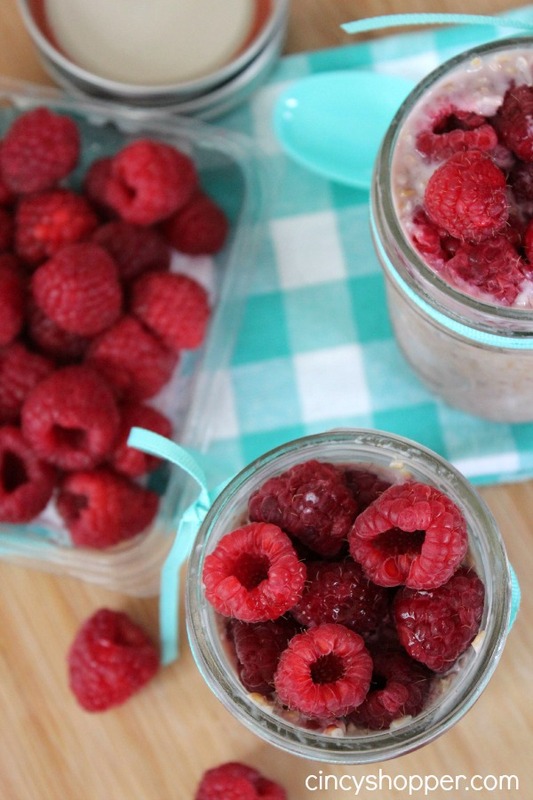 Fill them with your favorite yogurts and berries or even add in some brow sugar or honey. 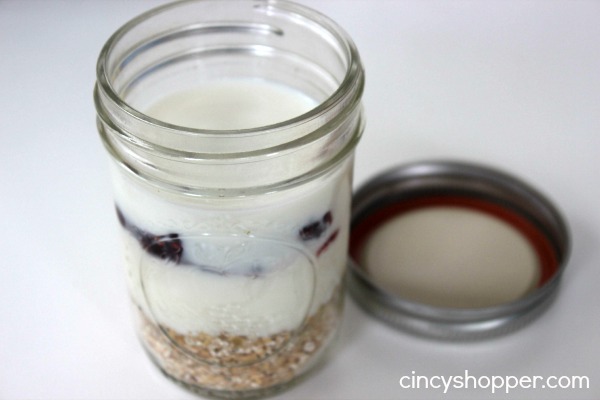 Having breakfast ready in the morning in a mason jar is such a time saver. I purchase some plastic spoons and breakfast is all set to go. No cooking no mess. Perfect! 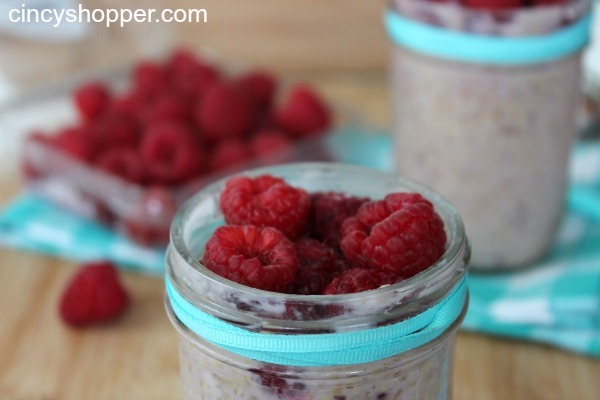 Fresh Berries are always a hit with my daughter so, this week she was taking Raspberry Vanilla Overnight Oatmeal for her breakfasts. We made a up a few so the boys could have them for their breakfast too! 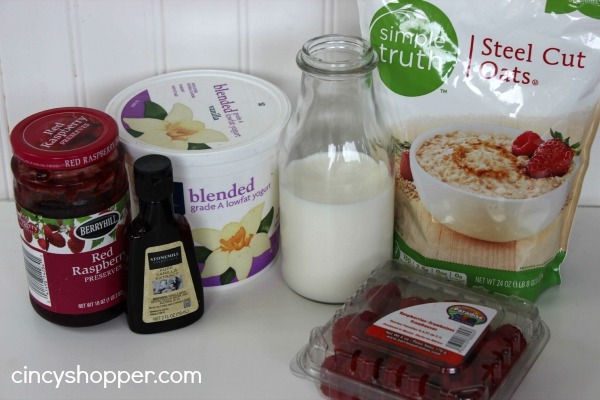 The Ingredients for your overnight oatmeal are so simple. Just grab your oats (we use Simple Truth Steel Cut Oats as the price is GREAT). We also purchase the larger containers of yogurt if we have not found a great deal on individual cups. Be sure to watch for marked down fruits if you plan to make your Overnight Oatmeal Breakfast immediately, it will save you some $$’s. Toss in your favorite flavors. So simple, just toss everything in and shake! 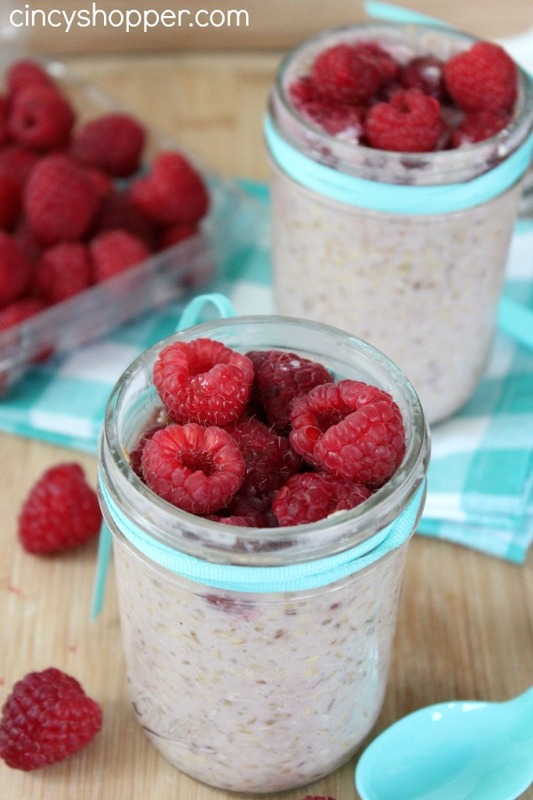 Mason Jars work best for these Overnight Breakfast (or at least we have found). So simple, convenient and no real mess. I like that the kiddos can make them themselves, ha ha! Make a great snack too! Looks really good. I was looking for new breakfast ideas and this looks like something I want to try. Thank you! Overnight?! Really? That’s brilliant! Thanks so much for taking the time to link up over at the #HomeMattersParty – we hope to see you again next week! I love overnight oatmeal! It is such an easy way to get breakfast in the morning without a lot of effort, and it taste great. It is also super economical and cheap :) Thanks for linking up to This is How We Roll Linky Party! Hi , this looks great but I’m a little confused. Don’t the oats need to be cooked first since they’re a hard texture? I’m thinking the same thing. Steel cut oats is much different than the quick oat.